On Monday I heard that the top four floors of the Arts Tower at the University of Sheffield would be lit up at night by coloured lights from Monday to Friday this week. So this was an obvious choice for my subject for week 9 of my 52 project. I saw the light show on Tuesday evening on the way home from my karate lesson and, although it wasn’t the greatest light show, I thought it would look good as a long exposure photo at dusk time. I was busy on Wednesday evening at karate again but free on Thursday so I decided to take the photo then. 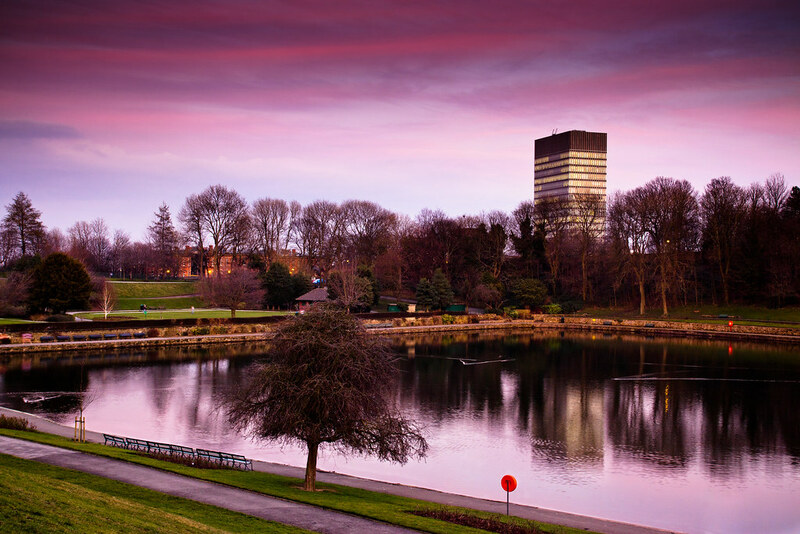 So on Thursday I headed over to Crookes Valley Park as the Arts Tower is reflected in the lake if you stand at the far end of the Park. I got there at 5.30 to catch the sunset. On previous evenings I had heard that the light show started at about 6PM so I figured I wouldn’t have long to wait. There was a lovely colour in the sky just after sunset so I took the photo at the top of the post. I then waited for the light show to start. At 6PM there was nothing. Nothing at 6.30PM. And nothing at 7PM either. I thought that perhaps they had decided to start the show later on Thursday than on previous nights but I was confident that it would start by 7.30PM as that was the time I drove past on Tuesday and the show was on then. 7.30PM came and went and still no show. I was starting to get get very annoyed (and not to mention pretty cold too). As there was no show at 8PM and I was really cold by now I decided to cut my losses and head back to my car. It took 15 minutes to walk back and I passed the front of the Arts Tower and there was still no show. My only other photos this week were at a kobudo course run by my karate club. I can’t share any of those photos as I don’t have permission from all of the parents of the kids on the course. So I have no choice but to use the photo above as my Week 9 submission to the View 52 group. It is an OK submission but it would look much better I think if the top four floors of the tower were lit up with different coloured lights!